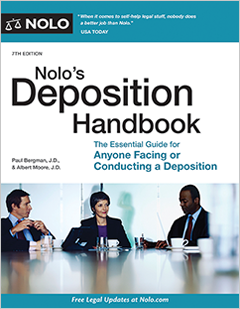 Nolo’s Deposition Handbook is a must-read for anyone taking, defending or facing a deposition. You’ll find all the information and instructions you need, whether or not a lawyer is representing you. Packed with concrete suggestions and examples, this book explains how to arrange a convenient date, prepare for the deposition and respond to questions with confidence. Best of all, you’ll learn the three “golden rules” for answering questions, and the trick questions lawyers often use to influence testimony. Albert Moore, a member of the California State Bar since 1978, is a law professor at the UCLA School of Law and the co-author of Trial Advocacy: Inferences, Arguments and Trial Techniques (West Publishing). Should You Take a Deposition? When Should You Visually Record a Deposition? This chapter is about deposition procedures. Unless you have had your deposition taken, these procedures will likely be unfamiliar: Most depositions take place in private conference rooms rather than in public courtrooms. (You may have seen depositions depicted in films like Class Action and The Rainmaker, but please don’t base your expectations on that!) Along with other information, this chapter describes how depositions are organized, how you might be able to alter the arrangements if necessary, and what role each person at the deposition will play. A deposition normally consists of a lawyer (or a self-represented person) asking the deponent (the person being deposed) questions. The deponent may be a party to the lawsuit or a nonparty witness (someone who may have case-related information, such as a bystander who observes an auto accident). Depositions may seem informal because they typically take place in conference rooms with no judge present. Yet do not be fooled—they share many characteristics with testimony in court during a trial. For example, as the deponent you’ll be placed under oath, and your testimony will be recorded and transcribed by an official court reporter. (Increasingly, depositions are videotaped as well. See Chapter 14.) Moreover, because the overwhelming percentage of cases settle prior to trial, your deposition may be your only chance to testify. Thus, lawyers often prepare as carefully for depositions as for trial. And because what is said at a deposition can have a major impact on the eventual resolution of a dispute, deponents should be as careful and as accurate in giving deposition testimony as they would be in testifying in a courtroom at trial. A deposing party (a party planning to take a deposition) has to give you advance written notice of the deposition’s time and place. This section explains these notice procedures. Your deposition process will start when you receive one of two types of notices. Which one you get will depend on whether you’re the plaintiff or defendant—a party to the lawsuit. If you aren’t a party, but a bystander or other nonparty witness, you’ll be personally served with a court order usually called a Subpoena re Deposition. (See Sample Form #1 in Appendix C.) A subpoena is a court order requiring you to show up at the deposition, and it is required for nonparties. If you’re a party, your adversary will provide you a more basic form of notice by mailing you (or your attorney, if you have one) what is usually called a Notice of Deposition. (See Sample Form #4 in Appendix C.) No subpoena is necessary to require a party to attend a deposition. of your legal claims or defenses if you repeatedly fail to attend. Though a Notice of Deposition is some­what informal, a subpoena is a court order. If you are a nonparty witness and you fail to obey a Deposition Subpoena, you can be held in contempt of court (in violation of a court order) and a bench warrant can be issued for your arrest. And if a judge finds you to be in contempt of court, you may be ordered to pay a hefty fine. The name, telephone number, and address (including probably the email address) of the attorney taking the deposition, and which party the attorney represents (for example, Attorney for Plaintiff). The title of the court in which the lawsuit is pending (for example, Central District Court, Cook County). A caption indicating the names of the parties (for example, York vs. Lancaster) and the official case number. Whether the deposition will be audio or video recorded instead of (or, more likely, in addition to) being transcribed by a court reporter (stenographer). Where the deposition will be held. Usually, the attorney who schedules a deposition holds it on home turf, in a conference room in the attorney’s law offices. However, an attorney might also take a deposition in a conference room provided by a court reporting service, especially if the deposition will require equipment which the deposing attorney lacks (such as a videotape setup or a video-conferencing facility for a remote deposition). The sections below describe the rules that parties must follow when preparing and serving deposition notices. As a general rule, as a nonparty witness you can’t be forced to attend a deposition more than 100 miles away from your home or place of business. (FRCP 45(c)(3)(A)(ii).) Parties may have to submit to depositions in more distant locales. If you’re a party and you think that having to be deposed in a distant locale will cause you an undue burden or financial hardship, however, see “Rescheduling Your Deposition,” below. Whether you are a party or nonparty witness, a deposition notice must give you reasonable advance warning that your deposition is to be taken. (See FRCP 30(b)(1).) Although there is no precise definition of reasonable, except in rare cases of emergency less than ten days notice is probably unreasonable. As a courtesy, many deposing lawyers will contact you or your attorney (if you have one) before scheduling your deposition to ensure that the chosen date is convenient. If you’re a party, you are not entitled to any payment for testifying at deposition. If you’re a nonparty witness, you can be paid, but in most localities you’ll receive a pittance (perhaps $40) as a witness fee, often accompanied by one-way mileage from your home to the deposition site (at a rate of about 40¢ to 50¢ per mile). Normally, a check for your witness fee will be attached to the Deposition Subpoena. If not, demand your witness fees from the person who serves you with the subpoena. If your demand for payment is ignored at the time of service, repeat the demand when your deposition begins. If you are again turned down, you may refuse to testify until the fee is paid. If the deposing lawyer refuses to change the deposition arrangements, send the lawyer a letter or email explaining why you want to change the deposition arrangements. If you believe that the deposition notice failed to comply with any of the requirements described, above (for example, you were given only five days advance notice), you should include that as well. Finally, state that you will not appear for the deposition and keep a copy of the correspondence for your files. This letter is to follow up on our telephone conversation of a couple of days ago. In that conversation, I told you that I am not able to appear for a deposition next Wednesday, October 28. As I told you, I had previously scheduled an important business meeting with three other people on that date, and it simply cannot be rescheduled. In addition to the inconvenience of the October 28 date, I was served with a subpoena on October 20, only eight days before I was supposed to be deposed. I don’t think that’s reasonable advance notice, especially for a businessperson such as myself. I repeat here what I told you on the phone. I will make myself available for a deposition if you give me reasonable advance notice, especially if you select any of the dates discussed: November 17 or 18 or December 1 or 2. Otherwise, please be advised that I will not appear for a deposition on October 28. Unlike ordinary nonparty witnesses, if you’ve been retained as an expert, you are entitled to your “usual professional fees” for the time you spend testifying at deposition. Experts’ deposition fees may amount to hundreds of dollars per hour. For additional discussion of expert witness fees and expert deponents in general, see Chapter 8. Such a letter may convince the deposing lawyer that you are serious. If so, the lawyer may agree to reschedule your deposition. However, if the lawyer continues to refuse to change the date and you don’t appear, the lawyer might go to court and ask a judge to sanction (penalize) you for failing to show up. You observed an automobile accident while on vacation in Florida and gave your name and address to a police officer. Several months after returning home to New York, you receive a Subpoena re Deposition ordering you to attend a deposition in Florida. The subpoena is invalid under Florida Rule of Civil Procedure 1.410, which provides that you can be subpoenaed for examination only in the county where you reside or are employed. First, you should contact the party that subpoenaed you and indicate that you will not attend the deposition. The party might respond by offering to reimburse you for any expenses you incur in traveling to Florida. You are free to accept or reject the offer. If you reject the offer to go to Florida, the party could come to New York and subpoena you under New York state law. If the party insists that you come to Florida at your own expense, you have the right to ignore the subpoena and simply fail to show up. Or you could retain a Florida attorney and have the attorney move to “quash” the subpoena (have it declared invalid). The order should be granted, and you should be reimbursed for your attorney’s fees. If you’re a nonparty witness, you may believe that you shouldn’t be deposed at all. For example, you may know so little about a case that a deposition is likely to waste everyone’s time, most of all yours. If so, your best bet is to contact the attorney who issued the subpoena and try to discuss the case informally. (Send an email, fax, or letter if the attorney doesn’t return your calls.) Attorneys usually don’t want to waste their time and their clients’ money taking unproductive depositions. An informal interview may convince the attorney that you are not worth deposing. If after discussing what you know with the attorney—or unsuccessfully attempting to do so—the attorney insists on deposing you, you may refuse to appear for your deposition. However, you run a substantial risk that a judge will hold you in contempt of court. Therefore, you should probably seek legal advice before refusing to be deposed at all. Alternatively, you could go to court and seek a protective order relieving you from having to be deposed. An independent bookseller has brought suit for unfair business practices against All Books, a book wholesaler, claiming that All Books discriminates against the independent bookshop and in favor of a nearby recently opened bookstore that is part of a national bookstore chain. All Books sends a subpoena for the deposition of Fay Perback, who owns the only other independent bookshop in town. Fay orders books from a different wholesaler, has no involvement in the lawsuit, and knows nothing about it. Fay thinks that the only reason All Books wants to depose her is to get back at her for not doing business with All Books by exposing her business practices to the other bookstores, making it more difficult for her to compete. If the deposing lawyer refuses Fay’s request to cancel her deposition, Fay may go to court and seek a protective order. Fay would explain to the court her lack of information and how her answers to deposition questions would waste her time and hurt her business. If the wholesaler can’t satisfactorily explain to a judge what information Fay has that might have a bearing on the case, the judge will quash the subpoena and order that Fay’s deposition not be taken. If you are a party to a lawsuit, FRCP 30(d)(1) limits your deposition to “one day of seven hours” unless the time is extended by a court order or you agree to a longer deposition. The seven-hour limit does not include breaks for lunch or recesses for the participants to stretch their legs, make phone calls, or see to other personal needs. If you are a nonparty deponent, your deposition may last more than seven hours if all the parties agree to an extension or if a court orders a longer deposition. Even though you are the deponent, you do not have the power to prevent the parties from agreeing to extend your deposition. The length of your deposition might vary greatly depending on the complexity of the case and the importance of your testimony, among other things. Even if your deposition will last longer than a day, you won’t necessarily have to be closeted away from your daily life for several days in a row. For example, even if your deposition is scheduled to extend over three days, you might arrange to testify only one day per week for three different weeks if that is all you can fit into your schedule. If you believe that a deposition is dragging on longer than you expected (perhaps the deposing lawyer shows up to take your deposition carrying pajamas and a toothbrush), you should ask the deposing lawyer how much longer it will last. If the lawyer is evasive or refuses to be pinned down and you have important scheduling conflicts—for example, you’re a physician with patients to treat or a parent who must attend a parent-teacher conference at your child’s school—politely indicate when you have to leave and when you might be available in the future for additional questioning. If you sincerely believe that you have answered all relevant questions repeatedly and the deposing lawyer is prolonging your deposition excessively, you might consider simply leaving. However, be aware that a lawyer who thinks you are trying to avoid answering important questions might respond by asking a judge to hold you in contempt of court. Who are the people you will encounter in the world of depositions? This section looks at all the significant players who typically are present (and sometimes not present) at a deposition. However, you shouldn’t threaten to walk out without good reason. If a judge thinks that you’re trying to avoid answering relevant questions or that you’re being excessively impatient or thin-skinned, he or she can require you to reimburse the deposing party for the costs and attorney fees it has to spend seeking a court order to resume your deposition. The party wants to lend moral support to a deponent who supports the party’s version of events or who is a friend or family member. For example, in a personal injury case, a plaintiff (the party suing) may attend her husband’s deposition taken by the defendant (the party being sued) if her husband was a passenger in the car at the time it was struck by the defendant’s car. The party wants to watch the deposi­tion of a deponent who supports the opposing party in order to evaluate the deponent’s demeanor and persua­siveness. This evaluation can help the party decide whether to agree to a settlement or go to trial. For example, a personal injury plaintiff might attend the deposition of the defendant’s accident reconstruction expert witness in order to evaluate how persuasive the expert’s opinions about how the accident took place might be to jurors. Parties are quite familiar with the issues involved in a case and want to be able to suggest questions to their attorney during breaks in the deposition. For example, assume that the party is a loan officer who is suing the bank that formerly employed her for wrongful termination. The party might attend a deposition of her former supervisor and suggest follow-up questions based on her intimate knowledge of the bank’s loan procedures. A self-represented party may be either the deposing party (the party who arranged for the deposition and conducts most of the questioning) or the defending party (the party who observes and can participate in a deposition arranged for by the other party). Should My Lawyer Attend All Depositions? If you’re a plaintiff or defendant who’s represented by a lawyer, you may wonder whether you really need to pay for your lawyer’s time to defend a deposition taken by the opposing side of a nonparty witness (for example, a bystander to an accident). Normally, the answer is yes, for the following reasons. Your lawyer’s presence can help ensure that your adversary’s lawyer doesn’t use overbearing tactics to goad a helpful but timid witness into changing his or her story. After your opponent’s lawyer concludes the deposition, your own lawyer can also question the deponent. Your lawyer thus has a chance to try to elicit helpful testimony that your opponent’s lawyer missed or clarify events that became muddled during the opposing lawyer’s questioning. At first blush, you might wonder why this is necessary. After all, if your opponent’s lawyer misses asking about information that’s favorable to you, you may think, ”Great, we’ll surprise them with it at trial.” Think again. Especially if you hope to convince your adversary to settle, having your lawyer bring out additional favorable evidence during a deposition can be quite helpful. A party who has retained an expert witness may bring that expert to observe the depositions of other witnesses. The expert can suggest questions and can learn factual information to support opinions. For example, in a personal injury case, the accident reconstruction expert for the plaintiff (the party suing) might attend a deposition of the accident reconstruction expert for the defendant (the party being sued), both to suggest questions for the plaintiff’s lawyer to ask based on areas of weakness and to find out whether the defendant’s expert is basing opinions on information not known to the plaintiff. Or a defense medical expert in a medical malpractice case may attend the plaintiff’s deposition taken by the defendant to observe the plaintiff’s present physical condition firsthand. A court might prevent a party from attending a deposition if (1) the party is a prisoner; (2) the party has previously harassed and threatened to harm a deponent; or (3) the party is the deponent’s business competitor who could use knowledge of the deponent’s trade secrets gained by observing the deposition to harm the deponent’s business. A party seeking to bar the opposing party’s attendance would have to obtain a court order in advance of the deposition. However, parties presumptively have a right to observe all depositions, and it is rare that a judge will bar a party from observing a deposition. Almost always, lawyers representing the two opposing parties will be present at a deposition—one side deposing, the other side defending. If a lawsuit involves many parties (as may occur in lawsuits involving complex property or civil rights issues, for example), the room may be crawling with Esquires. Nonparty witnesses, such as a bystander who observed an auto accident or an employee who overheard an argument between a supervisor and a former employee suing for wrongful termination, have the right to be represented by an attorney of their own choosing when they are deposed. Nonparty witnesses exercise this right rarely. Normally, with little or no stake in a case’s outcome, nonparty witnesses have little incentive to pay a lawyer by the hour to sit through a deposition. You fear that you might be named as a defendant in the same or a later civil lawsuit, by the same or a different plaintiff. For example, your employer has been sued based on your alleged carelessness or other misconduct. You work for a piano moving company that has been sued by a homeowner after the piano you were moving careened down a long flight of stairs into the homeowner’s garage and car. A party (such as your employer) has asked—or strongly suggested—that you lie during your deposition. You are worried that the party will eventually try to shift blame to you, or that perjury charges will be filed against you if you go along with the request. You supervised a former employee who is now suing your employer for wrongful termination. Your employer has suggested that you testify untruthfully to corroborate the employer’s claim that the former employee was insubordinate. Criminal charges might be filed against you or someone close to you as a result of the same claims involved in a civil lawsuit. A city has filed a civil suit against your employer, a contractor, to recover money that the city paid for work that the contractor falsely claimed had been done. Criminal fraud charges may also be filed against several employees, based on the same alleged misdeeds. In each of these situations, you may want to review your options with an attorney prior to being deposed and possibly have the attorney accompany you to the deposition. In addition to consulting with you during deposition recesses, your attorney can also help protect your legal rights. For example, your attorney can advise you of your Fifth Amendment right not to answer a question if the answer could incriminate you. Employees may be able to obtain legal representation for their depositions at no cost to them. If your employer is being sued and you receive a deposition notice, you may be able to secure legal representation at the deposition without paying for it yourself. Advise your supervisor or your employer’s in-house legal counsel that you’ve received a Deposition Subpoena and that you’d like the employer to provide you with legal representation at the deposition. Although the employer is not legally obligated to agree to your request, many employers will be happy to ask the lawyer handling the case on the employer’s behalf to represent you as well. You and the employer may share the same interests, so you both benefit if a lawyer helps you prepare for your deposition and represents you at the deposition. At a deposition, the court reporter places you under oath (makes you swear to tell the truth under penalty of perjury) and records all questions, answers, and comments for the duration of the deposition. Most court reporters transcribe testimony on stenography machines or computers, though some will also audiotape in case they miss a bit of testimony. Within a few weeks after a deposition concludes, the court reporter will prepare a word-for-word transcript of the deposition in a booklet, which you will be asked to review (see “Reviewing and Signing Your Deposition,” below). If you’re a deponent, you can probably bring a friend or relative along to a deposition for emotional support. You could do this at trial and, under FRCP 30(c), deposition examinations are supposed to proceed “as permitted at the trial.” Even in a locality where the right to have a supporter attend is unclear, the deposing attorney will likely agree to a polite request, especially if the deponent is a child, is infirm, or otherwise may have difficulty testifying without a support person in attendance. The companion may not, however, help the deponent answer questions. Don’t reveal confidential informa­tion to a companion. Deponents who bring a companion along to a deposition have to be careful about what they say to the companion before and during breaks in the deposition. The deposing lawyer can and some­times does present a Deposition Subpoena to the companion, asking the companion to reveal what the deponent said. What deponents say to their attorneys is protected from disclosure by the attorney-client privilege, and in many states what one spouse says to another is protected by the spousal privilege. In a few jurisdictions the privilege extends to registered domestic partners. However, no general friend or relative privilege exists—which means your case-related conversations with a companion are fair game for the opposing lawyer. A Notice of Deposition or Request to Produce Documents (for parties) or a Deposition Subpoena Duces Tecum (for nonparty witnesses) may indicate that you are to bring designated documents or records to a deposition. If the document request is clear and relatively easy to comply with, simply show up with the documents. Bring original documents if you have them, but do not allow the deposing party to keep the originals. If the deposing party wants to keep a document, ask the party to make a copy of the document and return the original to you. Know the rules before turning over documents. If you’ve been asked to bring documents to your deposition, be sure to read Chapter 3 before reviewing those documents or bringing them to the deposition. The document request may be improper under the rules of the discovery process, or some of the requested documents may be privileged and therefore shielded from disclosure—in other words, you may not have to share them. Some days or weeks after your deposition, the court reporter will make a written, word-for-word transcript of your deposi­tion testimony, which you must review, correct, and return within a set period of time. For procedures relating to reviewing and correcting the written transcript, see “Reviewing and Signing Your Deposition,” in Chapter 4.